Interpreter Who Signed Mandela Memorial Was Phony! Ahh, the best laid plans of mice and men. 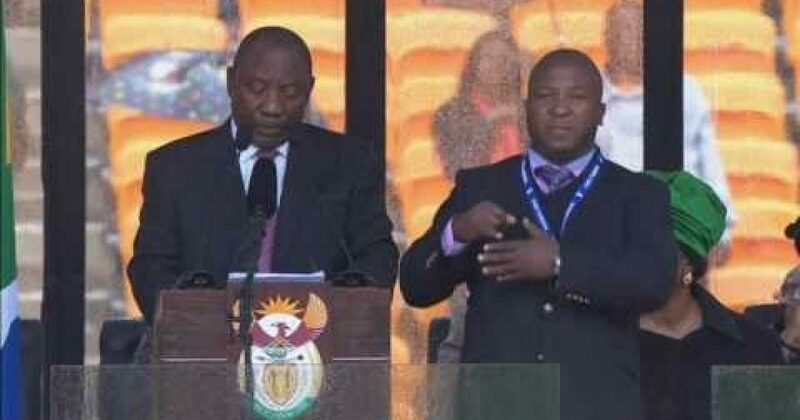 According to sign language experts, the interpreter who signed Nelson Mandela’s memorial on Thursday for deaf viewers was a phony. According to the Deaf Federation of South Africa, the guy was making up his own signs. He said sign languages across the world share a similar structure and pattern, but his were just strange repetitive hand movements. Mr Buxton, whose wife is South African and also deaf, said neither could not believe what they were watching. “It is incredibly disrespectful and hurtful to the deaf community,” he said. The World Association of Sign Language Interpreters (WASLI), Sheena Walters, also said the sign language used was not recognisable as any accepted form of international or South African sign language. The man was seen on stage immediately next to the speakers, which included members of Mandela’s friends as well as world leaders, but seemed to be out of shot during Mr Obama’s speech. Wilma Newhoudt, a member of the ruling party and the first deaf woman to be elected to the South African Parliament, said the man communicated nothing with his hand and arm movements. Asked about the claim by The Associated Press, South Africa’s government said it was preparing a statement. South African Sign Language interpreter Francois Deysel said on Twitter that the interpreter was “making a mockery of our profession”. In related news, Alex Wagner of MSNBC said the interpreter was placed there by the tea party extremists who control the Republican Party.